"New Toy" days were always a favorite at the home daycare my son attended before our move -- when the toys were rotated and there were all new things to play with. In the past, I've done an ok job packing up toys that my son has outgrown (I did some extra sorting before the move last fall and probably due for another round soon) but I haven't done much for rotating toys to keep them "fresh". Last week, we had a little friend staying with us for a few days -- a sweet one year old girl whose parents were out of town. So we packed up the big boy toys in the lower living room where most of our indoor playtime happens (think small cars, small metal farm toys, etc) to make room for some toddler toys for our little friend. It was so fun to watch my son rediscover his old toddler toys -- his little people train, Noah's ark set, and the plastic squeaky blocks. We also got out his set of mega blocks (which hadn't been packed away but we hadn't played with them much this summer). The toys kept his attention longer and he so was excited to play with them. I think I need a way to rotate toys this fall and winter -- both to help control the amount of toys that come out at a time and to help keep them fresh and interesting when we are spending more time indoors. I'm going to have to give it some thought to have a plan that doesn't take up lots of storage space but also easy to do so that we can rotate often enough. I have plenty of extra plastic tubs, maybe just setting aside two tubs for toy rotation and keeping them together in the storage area. A set schedule for sorting toys to remove what's not being played with also might be good, likely late winter after Christmas and his birthday. Do you rotate your kids' toys? Or only pack up what is not played with or "too young" for them? How often do you go through their collection toys? 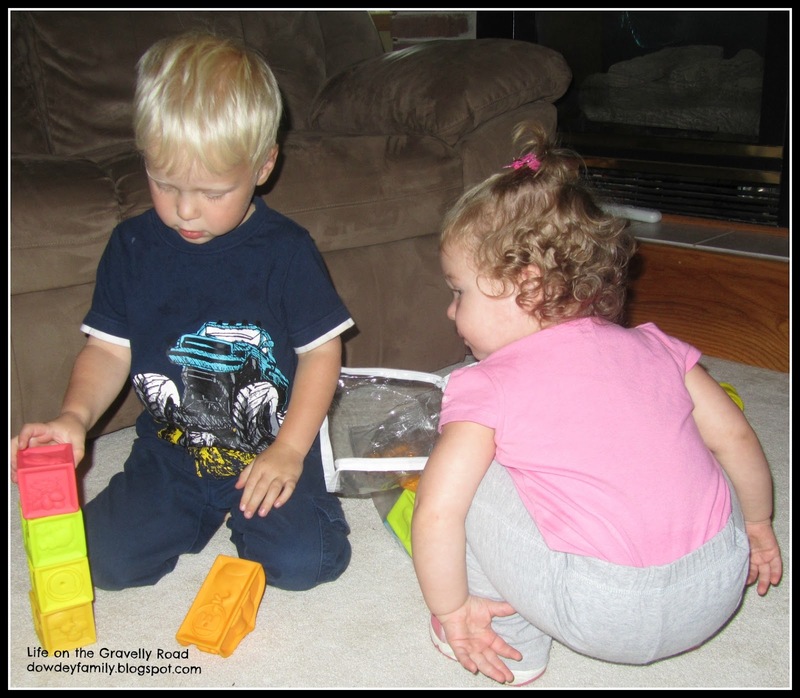 Linking up with this week's "Mama Loves" over at Pontifications of a Twin Mom. I have a larger toy corner that I rotate. In the rotation are a tool bench, a car ramp, and a Loving Family dollhouse set. I should rotate more of their toys because it works really well!